What Activities Can I Enjoy with My Bulldog? There are many activities available for you to enjoy with your bulldog. If you have a show-quality dog, show him in AKC "conformation" dog shows. These are shows where your dog is judged against the breed standard and winning points are accumulated to achieve a Championship title. Whether or not you show your bulldog in conformation, you may also choose to show your dog in "rally," a more relaxed and fun form of teamwork obedience, as well as in regular obedience events. Why Should I Show / Train My Bulldog? Training and showing your bulldog brings a multitude of benefits. Bulldogs are powerful dogs and can be unruly; training develops them into good canine citizens. Showing is a social activity that not only will deepen your bond with your bulldog, but will bring you together with others who share the love and knowledge of the breed. Showing can be a family event; children between the ages of 9 and 18 can show in Junior Handling competitions, or simply help out with dog care. And when you show, you have a built-in excuse to travel! How Do I Get Started with Showing? The best way to get started with showing is to talk with your breeder about your dog's show qualities. 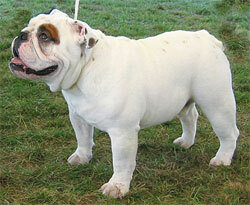 Also, attend dog shows and events with bulldog entrieswatch and ask questions. If you have a puppy, get started with puppy training classes, and ask about training options for your mature or rescue bulldog. Licensed show superintendents help put on the dog shows. They send out the show information and entry forms (premium lists). Contact them to be added to their mailing lists.